March 15, 2018, 11:54 AM · When Los Angeles Chamber Orchestra Concertmaster Margaret Batjer received the score for Pierre Jalbert's new Violin Concerto, "I was super-excited, like a little kid at Christmas," she said. She opened it up, looked through it excitedly, and then she put it on her studio desk. She kept looking at it, but it took her a long time to feel ready to take out her violin and start learning the nuts and bolts. "I found that kind of interesting, that I didn't immediately grab the part and start learning it," Batjer said. "It just sat in my studio and I looked at it a lot; I didn't take the violin with it until much later. I wanted to have a moment to really digest the score before looking at the violin part, to sort of get an overview of what I thought he was going for." Batjer will perform Jalbert's Violin Concerto this weekend with LACO and conductor Jeffrey Kahane, in a concert that is actually the third "premiere" for the concerto. Jalbert wrote the piece for three concertmasters: Batjer of LACO; Steven Copes of the Saint Paul Chamber Orchestra; and Frank Almond of the Milwaukee Symphony. Batjer is actually the last to give her premiere; Copes performed the work last June (review here and performance here), and Almond performed it last month (review here). All three orchestras co-commissioned the piece from Jalbert, who is currently composer-in-residence for LACO. This weekend's performances will be professionally recorded for a CD celebrating Batjer's 20 years with LACO. 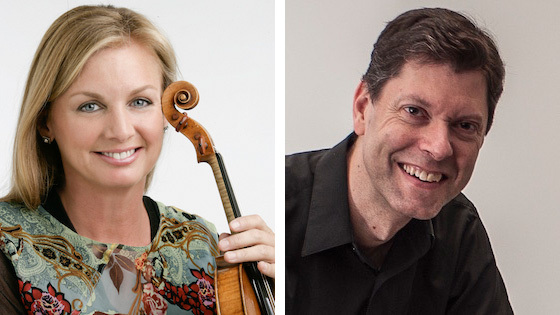 Los Angeles Chamber Orchestra Concertmaster Margaret Batjer and Composer Pierre Jalbert. How does one go about learning a piece that's almost completely new? For this concerto, "it's very tricky to sort of sit and read it at the piano," Batjer said, and even Kahane, a pianist, agreed on that point. "But I had received a link that Pierre sent me in the summer" -- a link to Copes' performance with St. Paul. Batjer vowed to listen to that performance only once, "because I didn't want that to influence how I played it." But it did help her to get a certain sound-scape into her mind, something to work with when she looked at the score. "I'd already heard the kind of orchestral texture of the piece, so then studying the score was very clear to me," Batjer said. It helped her to imagine the sound, "then once I started bringing the violin out with the piece, it just fit so well with what I imagined it would be." "The concerto is in two movements, and it's a 27-minute work -- so it's not short," Batjer said. "It starts with a very ethereal and mysterious introduction, and then the first movement is a Scherzo that has bookends of this kind of whimsical and ethereal writing for the violin and orchestra. It seems to feature the sort of organic connection between the different wind instruments, and it has a lot of percussion, a lot of vibes and piano. So there are a lot of textural colors from the percussion instruments that enhance that feeling that I see in the score, that I can imagine really meld with the violin. And the second movement is a very rhythmic, very driving kind of movement that ends with a kind of explosive cadenza coming out of an orchestral tutti. It's a very exciting piece to play. It's written so well for the violin -- difficult, but written well." Jalbert, who is 50 and teaches composition at Rice University, studied piano and composition at Oberlin Conservatory before earning PhD in Composition at the University of Pennsylvania, studying with the avant-garde composer George Crumb. Jalbert's own style, as described on his website, tends more toward the "tonally centered, incorporating modal, tonal, and sometimes quite dissonant harmonies while retaining a sense of harmonic motion and arrival." "His harmonic line is interesting. He uses very odd scales in his violin writing, and it took me a while to grasp that part of his writing because it's not traditional," Batjer said. "In my career I've performed a significant amount of contemporary music, and what I always appreciate foremost with composers is their sense of harmonic development, their architecture." Very early in her tenure with LACO, the orchestra played a new work by Jalbert, and "Pierre's music is always so well-written. There are pieces that you play where everything has to be sussed out and everything has to be adjusted -- Pierre's music I've always found very intuitive: you get it." Batjer first started trying to find a way to commission a violin concerto from Jalbert eight years ago and is thrilled that it finally came about with this tri-commission. "One word I use with this concerto a lot is 'whimsical,'" Batjer said. "It has a whimsical quality to it: these beautiful textures coming out of the orchestra, and how that melds with the violin. It's just an exceptionally well-written piece!" Happy 300th Birthday to the 'Milstein' Stradivarius!